A main star of pet therapy at Regency is our administrator Lorrie’s companion Bella. The first stop for Bella is the activity room where residents are gathered to interact, have fun and pet her. Her visit also helps residents stay engaged with the world and as a link to more socialization with others. After the activity room Bella then makes “house calls” to the residents unable to join us in the activity room to bring cheer and warmth. 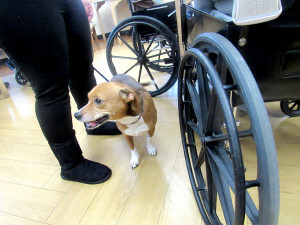 Throughout the month other members of the Regency staff also bring their dogs into the facility for the residents. These special guests are a part of the Regency family and are always welcomed with open arms. Our residents look forward to their favorite four legged friends and always give positive feedback regarding the visits.